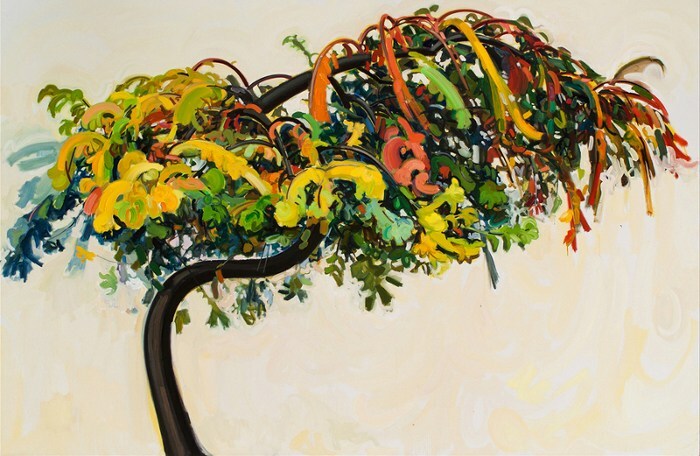 Dena Lyons is an American contemporary artist known for her colourful paintings of trees. Lyons’ thoughtful sensibility, the colour choices and dynamic brushwork, are a reflection of her adventurous journey through life. Born in 1980, in Boca Raton, southern Florida, Dena Lyons started taking painting lessons and was encouraged to apply for the local arts magnet program at the age of 12. Lyons graduated from the prominent Dreyfoos School of the Arts in 1998. In the same year, she was awarded a merit scholarship to the well-respected Marchutz School of Painting and Drawing in Aix en Provence, and moved to France to continue her studies. In 2002, on a merit scholarship Dena attended the School of the Art Institute of Chicago, where she earned a BFA. At the same time, Floridian artist was awarded merit scholarships to study painting at Ox-Bow in Michigan. After completing her formal education, Dena Lyons returned to France. Supporting herself with plain air painting, she spent 5 years exploring the country she had fallen in love with years before for both its stunning beauty and energizing artistic inspiration. For the past several years Dena has maintained both US and French residency while continuing to pursue painting in France which is her primary residence and choice for living and working. Dena Lyons creates thoughtful and monumental works of art by using a simple object, a tree alone which she calls Portraits of Trees. 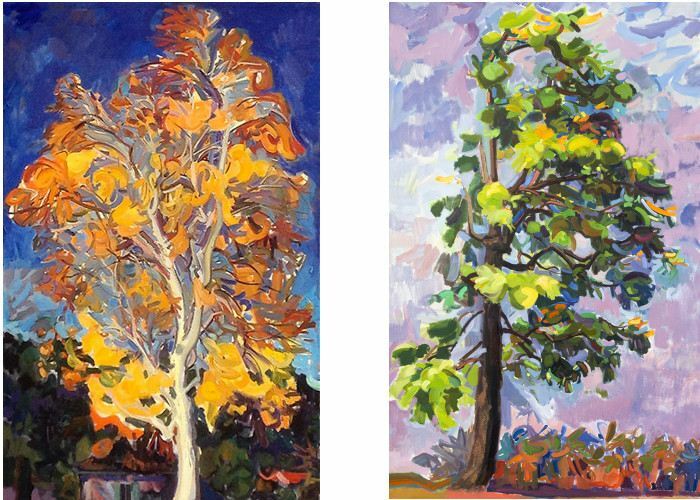 Featuring trees of different sorts, shapes and colours, her works revolves around la joie de vivre. Usually made with oil and wax on canvas, Dena’s paintings are dynamic, figurative pieces, full of energy, and defined by subtle color choices. Lyons’ organic sensibility is influenced by the Fauvist style, especially Andre Derain, her form of abstract interpretation allows a journey through the form, colors, and brushwork into a world of sensations. Each Portrait of a tree represents a different aspect of the human condition: desire, hope, humility, and revery, among others. 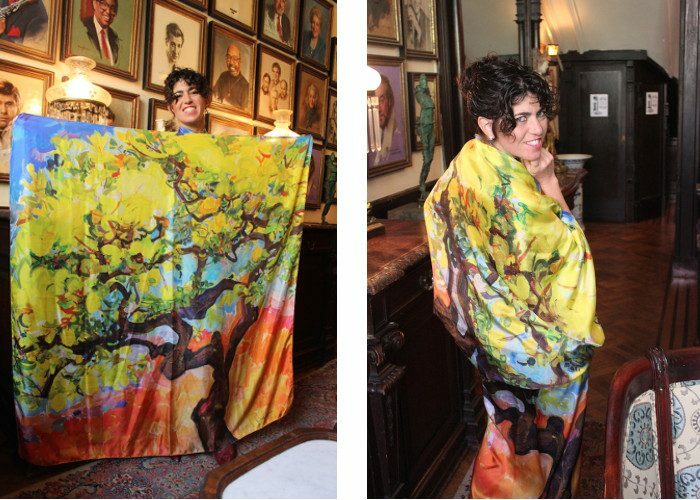 Dena Lyons’ Portraits of Trees has been the basis for her new path in the fashion industry, she merges art and fashion in beautiful scarves that could be uses as a dress, as well. For her new line of silk scarves, Dena is collaborating with Roberto Cavalli on the designs which take her imagery from her paintings and transfer them onto silk. Latterly, her scarves has been included in numerous fashion shows including one at the Lighthouse Arts Museum. Represented by the Marin Price Gallery in the Washington DC area, and Galerie Villa Köppe in Berlin, Germany, Dena has participated in many solo and group exhibitions at USA and abroad, including Gregory Gaymont Gallery, Addington Gallery, Gallerie MK in Chicago, Rome Art Coterie, Rome, Italy, and Galerie Imprevu, Honfleur, France, amongst others. Her works of art are owned by respected collectors around the world, including Dreyfoos School of the Arts, Nippon Steel and Chateau Bois Guilbert. Lyons received the mayor’s medal of excellence for her opening in Beausoleil. She is a member of the International Association of Fine Arts in Monaco. Dena Lyons currently lives and works in Monaco.